How are electrical manufacturers preparing for digital success? 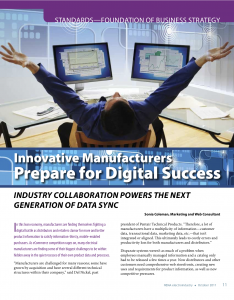 An article I wrote for NEMA’s ei Magazine delves into how data synchronization is changing, and the new tools that manufacturers are using to collaborate with their distributors. The article primarily discusses IDEA’s new Data Management Platform, which enables manufacturers to stage their data in one place and publish to various markets, including distribution and retail.